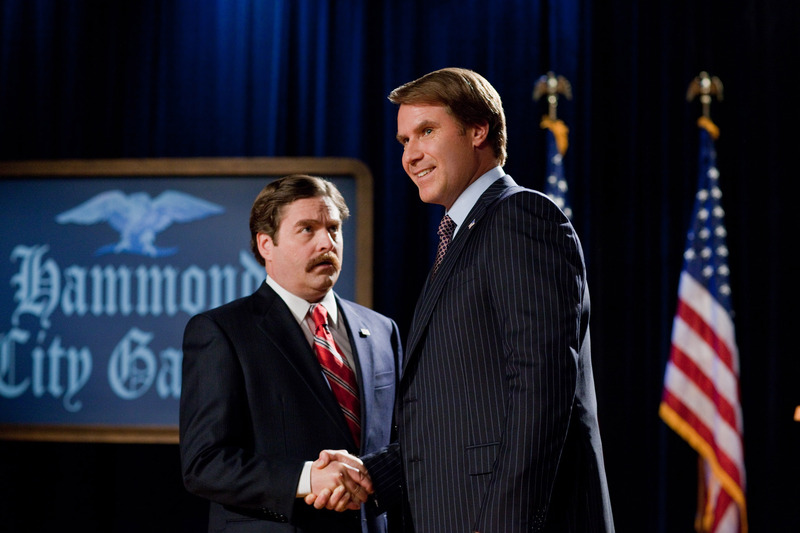 (L-r) ZACH GALIFIANAKIS as Marty Huggins and WILL FERRELL as Cam Brady in Warner Bros. Picturesâ comedy “THE CAMPAIGN.” ©Warner Bros. Entertainment. HOLLYWOOD—Will Ferrell has three words for Congress: stop screwing around. At least that’s the message he’s taking to Washington on his so-called Whistle-Stop Tour Across America, which kicked off here Tuesday. Ferrell and Galifianakis are promoting the movie in an usual way. They are traveling around the country, stopping at various cities, to promote it. The Tuesday event launches an 11-city whistle stop-tour of public appearances that will continue through July 31. On the first leg of their tour, Ferrell and Galifianakis are headed for Dallas/Ft. Worth on July 18, followed by Chicago and Seattle on Thursday, July 19. On Friday, July 20, they arrive in San Francisco. The second leg will then take them to Boston and Toronto on Monday, July 30, and on Tuesday, July 31, appropriately enough, they will wrap with visits to Philadelphia and Washington, D.C. Among the trip’s scheduled highlights, Ferrell and Galifianakis will coach opposing teams in a tug-of-war contest at the Naval Air Station Joint Reserve Base in Ft. Worth, which will later host an advance screening of the film. At Chicago’s famed Wrigley Field, the two will throw out dueling first pitches at the Chicago Cubs/Florida Marlins game and in Toronto, they will visit Canada’s beloved Hockey Hall of Fame, where their arrival will coincide with the arrival of the also-touring Stanley Cup. In Philadelphia, they will don tricorn hats and attempt to recreate the signing of the Declaration of Independence and finally, in D.C., pose for photos as the U.S. Capitol. “The Campaign,” opens in theaters Aug. 10. Here’s what they had to say Tuesday about their movie and promotional tour. Ferrell: With the state of how crazy politics is getting, we thought it’d be a very timely and funny way to kind of make fun of politics. Question: Zach, you play a character named Marty Huggins who challenges the Republican incumbent for his seat. What’s Marty all about? Galifianakis: Thank you for asking. Marty Huggins is a guy who’s kind of a black sheep of his family. He comes from a political family and they have all kind of ostracized him, but because he has a family name and there is an incumbent, Cam Brady, who’s standing right there (Ferrell’s character). They put him up to challenge Cam’s campaign because there is family recognition. It’s like putting a Kennedy up there in North Carolina. So I’m kind of the fish out of the water when it comes to the political game, and I think that Will’s character is very savvy at it. Question: Will, you play congressman Cam Brady. What does he stand for? Ferrell: Cam Brady is for anything that will get him elected. He is a four time incumbent. There are whispers that he’s potentially going to be picked to be vice president. That’s as high as his aspirations go. He likes the idea of being a vice president, where you don’t have to really work too hard. He has some shortcomings. He’s a little bit of a philandering politician and that opens the door for Marty to begin his campaign. Question: When politicians go and see this campaign, whose bell are you going to be ringing? Ferrell: We’re making fun of kind of all of them. I think you’ll see shades of a lot of different politicians that we’re kind of poking fun at. Question: It seems like you’re both a fine team for adlibbing. Can you talk about ad-libbing during this shoot? Ferrell: I don’t think we can. Question: Did you always both go out for the roles you’re playing now, or was there every any chance you might’ve switched parts? Ferrell: I auditioned for ‘Batman’ and Warner Brothers (which also is the studio behind “The Campaign” said that it was already taken. Galifianakis: I auditioned for “Fat Man” and that was taken also. Question: You’ve been a recipient of The Kennedy Center Honors and you’ve rubbed shoulders with politicians so do you have a message for Washington? Ferrell: My message to Washington is stop screwing around. That’s my message. Question: How dirty does it get on the campaign in the movie? Ferrell: It gets fairly dirty, yeah. I think politics have gotten vulgar and we comedically portray that. Question: What’s in the audience in store for on August 10th when the campaign is unleashed in theaters? Galifianakis: We’re hoping the audience enjoys it. It’s poking fun at the political system. There’s very good jokes in it, and also there’s a little bit of a message that doesn’t swing right or left. It’s just a good message for the American people as a whole.